Online penny auctions have exploded across the internet. This new way of getting everything from gift cards to laptops offers successful buyers unbelievable values – literally pennies on the dollar. The variation on the auction theme comes with a caution, though: Let the bidder beware. You may lose a bundle. The guide includes Penny Point tips and Common Cents advice to help you dissect the jargon. If you’re going to win on sites like Beezid and QuiBids, you need this book. 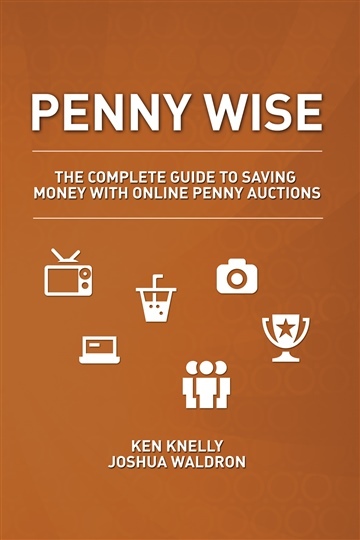 Penny Wise: The Complete Guide to Saving Money with Online Penny Auctions will help you get started, stay in the game, and take home more than pennies. Joshua Waldron is the founder of PennyAuctionList.com, a dynamic one-stop, user-oriented site featuring penny auction news, ratings, and more. He also owns Studio JWAL, an award-winning web design firm, and is a high school social studies teacher. He lives in the scenic Blue Ridge Mountains of Virginia with his wife and three children. "[Penny Wise] will help people learn what penny auctions are, what they are not, and most importantly, how to save their money. Great work!" "[Penny Wise] not only satisfied my needs as a beginner, it introduced advanced concepts and ideas for future reference. Waldron provides the reader with a clear and thoughtful review of the penny auction industry and the mechanics of penny auction sites generally. He also provides explicit and actionable tips on how to succeed at penny auctions -- and importantly, how to avoid the truly bad ones. What's more, this book is well written, professionally edited (I suspect), and formatted for an easy read. I know that may sound trivial, but when you buy as many how-to/tip books and guides as I do, it's a real pleasure to see great content that's well dressed too. If you're interested in learning more about penny auctions, then I highly recommend Penny Wise."